Daniel Garber (1880 – 1958), Tanis, 1915, oil on canvas, H. 60 x W. 46 1/4 inches. Philadelphia Museum of Art: Purchased with funds contributed by Marguerite and Gerry Lenfest, 2011. On view in the Putman Smith Gallery through April 14, 2019, Poetry of Light is a special installation of works by renowned artist Daniel Garber (1880-1958) that examines the incredible craftsmanship for which he is known: close, almost tapestry-like brushstrokes; a restrained use of color; and, most importantly, his dramatic use of light. 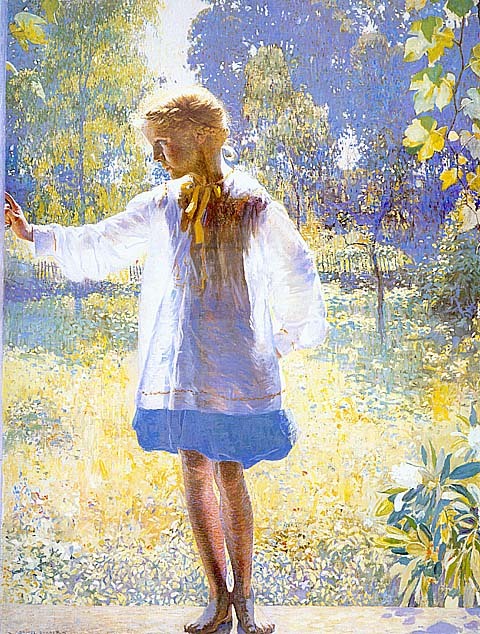 At the cornerstone of the installation is Garber’s highly acclaimed portrait of his daughter, Tanis, for which he was recognized with the National Academy prize in 1915. Accompanying Tanis are eleven additional works, including paintings and drawings, that illustrate the “dual sensibility” as a decorative and realist painter for which Garber is known. This special installation allows viewers to look across genres and mediums, revealing the artist’s skill, style, unique sensibility, and masterful handling of light, and illuminates Garber’s legacy as one of the most influential figures in American art. This is one in a series of American art exhibitions created through a multi-year, multi-institutional partnership formed by the Philadelphia Museum of Art as part of the Art Bridges + Terra Foundation Initiative. Launched in 2017, the Art Bridges + Terra Foundation Initiative is a joint grant program of Art Bridges and the Terra Foundation for American Art that aims to generate exhibitions at more than 50 arts venues nationwide. The initiative supports multi-year, multi-institutional exhibition partnerships among groups that include a metropolitan museum and institutions in primarily non-metropolitan areas that work together to engage local communities with outstanding works of American art. Sharing collections and resources, these collaborative partners create a series of exhibitions of art of the United States that are content rich, include in-depth educational and interpretive materials, and are designed to meet a spectrum of audience interests. The grants also foster professional-development exchanges between partners and across groups.